No, these aren't your family or friends but they may be unwelcome visitors to your home. What you see next MAY leave you feeling like things are crawling on you. AAAaaarrrrgggh! There you have it.... the dirty rotten, stinkin', FLEA!! And it's making our lives MISERABLE right now. It all began a few weeks back when we noticed our upstairs cat acting strangely. He meowed and raced through our bedroom from carpeted areas to linoleum floors. He sat up high on furniture. It only took us a couple of days to realize it was a flea problem and treat him with Frontline. Ah, problem solved you say? Our dogs are on a Frontline program but Randal the cat wasn't, so we thought the Frontline would be a quick fix. Not so. That day we began the regimen of vacuuming every night and morning and spraying with a well known brand of flea spray. And the cat now has a flea collar on top of the Frontline. We've been doing that for weeks and it is getting better. Today though, we are going to put off a flea bomb upstairs, removing the cat of course, and later in the day, giving the cat a bath to hopefully remove the rest of those dang little buggers! Meanwhile, while our focus was on the cat upstairs, the dogs came down with the same problem. These are dogs that we started treating in early March with Frontline Plus so they wouldn't have this problem. They are now in the miserable stage. After making some inquiries online, we found out that some fleas may be becoming immune to that particular kind of chemical so we switched it up by using Advantage this month. 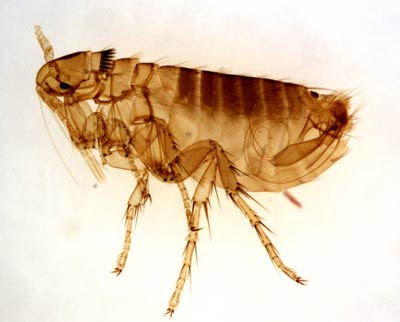 And, like our poor cat, the dogs are going to have a flea bath today, flea collars on top of the topical, and we are bombing the downstairs of the house (moving our sweet little tropical fish outside for the day). This has been a REAL NIGHTMARE. A real EXPENSIVE nightmare and I'm gonna be glad when its all done. "FLEAS, WE ARE GOING ON VACATION AND YOU BETTER TOO! YOU ARE NOT WELCOME BACK!" This is just a quick postscript....when you have a problem, take care of it early. When we got back from vacation our problem had really escalated! Our cat seemed sick so we took him to the vet. He was listless, not eating, acting mental, it was almost as if he were possessed! They did a thorough exam on him and decided to take blood. He was SO anemic they thought he was only a day away from dying!! We had no idea the problem was THIS bad. We had to bring in one of our other cats for a cat to cat transfusion... yes, you heard it right, a transfusion. You can only imagine what that cost!! Then it was Vectra for 3 cats and Vectra for 3 dogs, iron pills for the two cats to build them back up again, two more flea bombs in the house and 2 boxes of 20 Mule Team Borax sprinkled all over the carpet, rubbed in, and after about 2 days sucked up with the vacuum. We are finally seeing the light of day again. This was the week after a week long vacation and the next week was my son's rehearsal dinner and wedding. It was an expensive month all around. So, if we had just bought the expensive flea treatment in the first place from our vet even though it was about $70 for the 3 pack for dogs and $90 for the 3 pack of dogs.... we would have actually saved money on how things turned out.